​a rare opportunity to get unstuck, quick! A deeply innate and seemingly ancient ability to use voice and sound to move and change energy with tremendous ease, Sharon Corsaro has a powerful gift that initially came forth from deep within, some 22 years ago, while connecting with nature. It arose spontaneously back then, and it continues to be extremely spontaneous, today. 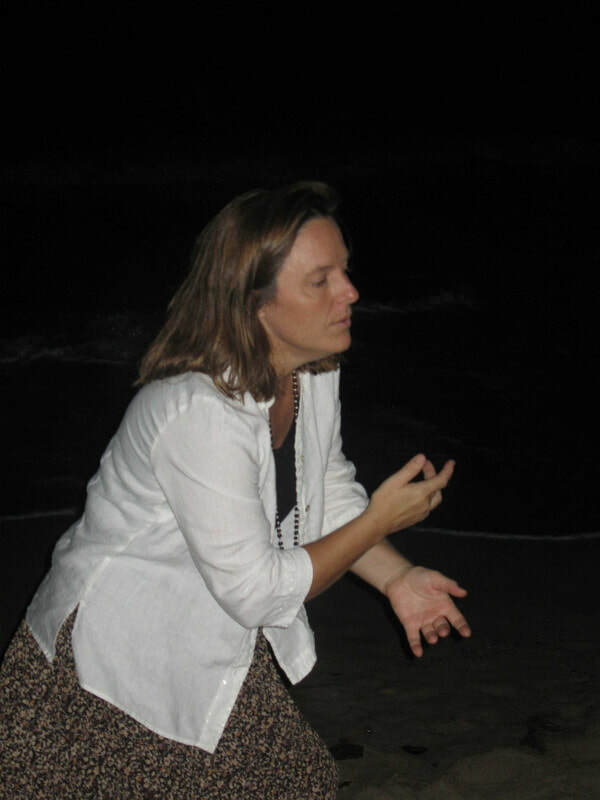 At first, back in the 1990s, Sharon’s gift grew quickly into a powerful healing modality that she shared with private clients… which quickly led to group work and later international workshops where Sharon taught groups in places around the world -- about consciously shifting energies, to help the healing process for people AND places. As her own conscious awareness of the gift grew, so did her skill, and… this work filled Sharon’s life for a long time. Then… a long period of “going quiet” came, and Sharon stopped all public sharing of this work altogether. Yet, as many a great artist can attest, a lifelong body of work has many seasons. And that has been exactly the case for Sharon. Over the years, she allowed the work to come forth in many different forms -- as an art form producing spontaneous song right on the spot with word and melody coming forth without plan right in front of live public audiences; as a powerful healing modality for both individuals and large groups; as a simple and innocuous blessing of “singing prayer” for large places to promote reconciliation for large-scale issues in our world; and as deep communion with and for nature and the elements of our earth. Sharon’s work with voice and sound has shifted and changed extensively over time. It has developed. It has changed. It has gone quiet. And today… it is coming out again anew… with THIS offer… to help others with the very potent tool of Sharon’s voice and creative counsel… to empower others to move through and change their own energy very quickly, to awaken and allow NEWNESS, while clearing the constructs of old patterns and issues that have held up the process of change -- for far too long. It is your chance to receive… and this offer makes it all very easy. In true “coming out” form… Sharon is here once again to offer her greatest gift in the form of private one-on-one Energizer Sessions that provide tremendous power in an easy to receive manner via internet. Whether the energy of our focus is a project, your life, a group or situation, a personal challenge, or the energy of a place – we connect, we get to the root of the situation, and we step into that “space” to mobilize, break free, activate, energize, clear, kick-start, and/or bring to life, the Spirit of YOU that has been waiting for so long to be more alive – and freed! Change happens... and sometimes, it needs a little kick-start, something to shake things up -- a tipping point -- to provoke *release* and empower *realignment*.... And that is exactly where the catalyst of clear vision, enormous heart, and the power of voice act together to mobilize and provoke the new, while activating and awakening the true Spirit of a situation, a person’s life or a project... to allow stagnant energy to melt away as new energy wakes up… and the individual lets go, to grow! This is a breakthrough offer, for a breakthrough service. Combining the gift of voice and spoken word to clear and activate new energy, this service shares Sharon’s powerful ability to move, shift and change energy – to literally change YOUR world, very fast. AND… To kick off her “coming out” offer to share this service anew, Sharon is also offering another gift... The opportunity to RECEIVE this on CREATIVE EXCHANGE... where YOU get to MAKE AN OFFER… for how you would like to EXCHANGE in order to RECEIVE a One-One Session. You can offer to provide a great REVIEW of this service after you receive your session. That can be done with a video, or by written word with your name and/or photo included. This will be used by Sharon to help share this service with others by sharing your “testimony” to help others decipher if this is for them. You can offer FINANCIAL PAYMENT. The value of this service is initially $220 per session, and a session varies in amount of time used (its not about time, its about impact). You can offer full payment, OR, for this intro offer – you can offer YOUR price – more OR less depending on your experience. You can REFER a FRIEND to help promote Sharon’s service by inviting others to get their own session with Sharon. This combined healing/creative coaching/soul activation/blessing/prayer service is a deeply personalized private session offered live via internet-based video and/or audio call. This is one session at a time, and it need not require many. It can be an enormous catalyst, so it could be just ONE session, OR, it could be many. It all depends on the individual. Through and including Winter Solstice, December 2017 – The Energizer one-on-one session will be offered for ONE PERSON PER DAY on Creative Exchange. Whoever asks first gets to receive the day’s session… and… Creative Exchange means… You get to offer something “creative” in exchange for one private session. You could offer to refer others to this service. You could offer to provide a heartfelt honest review that Sharon can use publicly to share this service with others. You could offer financial payment. You could suggest another creative exchange… It depends on YOU. So… the season of giving is upon us... and this offer is made with all heart... in hopes that YOU may get to enjoy some form of this service... before the year ends! This offer is valid for December 14-21, 2017.... after THAT -- we will see! The Creative Exchange Offer, to receive The Energizer Session with Sharon Corsaro on Creative Exchange, is valid through Dec 21, 2017 -- where ONE person per day will receive this service scheduled on a first come, first served basis. TO BOOK YOUR SESSION, please submit your name with a note right here!